Explore this amazing collection of records from Ireland’s Western Seaboard from 1821-1874. The records come from The National Archives at Kew and relate to the Irish Reproductive Loan Fund. This is the first time these records have been made available in full online. The majority of the records cover the years 1824-1846 and provide unique information about your ancestors from before and during the Irish Famine. They are an excellent resource for the Irish family historian, because they record the names of individuals, who are often missing from official government records. Many of the records are loan application forms, which include the name of the borrower and two names of guarantors, who were often close family members or neighbours. Other details recorded include occupation, notes of health, family circumstances and whether the borrower emigrated. The information found in the image will vary depending on the type of document you are viewing. Below we have listed the various types of documents found within the records and the information you will be able to find in each. The Irish Reproductive Loan Fund was a micro credit scheme set up in 1824 to provide small loans to the 'industrious poor.' Local associations and committees administered the scheme, most often from a small town in a rural area, and county committees oversaw their work. The records of the local associations and county committees are in The National Archives at Kew, known by their reference T91. The majority of the records cover the years 1824 to 1846 across ten counties in Munster and Connacht. In early 18th century Jonathan Swift, the well-known Irish writer and Nationalist, created a charitable loan fund from his own wealth to support poor tradesmen. He loaned out small amounts, which could be repaid weekly without interest. To secure the loans he asked the borrower’s neighbours to be guarantors. The enterprise was successful and Swift lost none of his initial investment. Following Swift’s venture, other local associations followed the same practice, notably the Dublin Musical Society, which began in 1747. The Society initially made loans from the profits made from musical performances. Following these examples, the Irish Reproductive Loan Fund was created in 1822 as the Irish Relief Committee with surplus relief funds from the famine of 1822, £55,000 in total. The money was reinvested into a microfinance institution, which gave short term loans for capital or reproductive purposes, such as purchasing fishing equipment, repairing sheds for curing fish or purchasing seeds for farming. The loans were never to exceed twelve months and the borrower was charged a modest interest rate. The whole system was centrally controlled in London, funds were distributed across ten county boards in Ireland and then further distributed to local associations. The committee became a corporation in June 1844, known as the Irish Reproductive Load-Fund Institution. The minimum age to borrow was 21 years old and the minimum amount was £1. The borrower supplied their address and occupation. Each loan was guaranteed by two sureties, who agreed to pay the loan if the borrower defaulted. A married woman (if her husband was still alive) could not agree to be a guarantor for a loan. Lending for most of the local associations ended by 1848 and eventually all records were returned to London. There are a couple of reasons why lending began to cease by 1848. Firstly, changes in legislation in 1843 meant that the associations were restricted in the interest they could charge on the loans. The legislation was not changed because the associations were charged such high interest, but they were creating great competition for the banks. The lower interest meant that many of the institutions had to close. Secondly, the catastrophic effects of the Great Famine on the Irish people led many to default on the loans; however, we do find in the records that during the years of the famine the associations are still able to collect their payments and pursued prosecution for those who did not pay. The records include those from the local associations, minutes from the county board meetings which met the first and third Saturday of every month and correspondences with London. Further follow up details about the borrowers can be found within the Returns to the Clerk of the Peace, which recorded whether they still resided in the townland where the loan was applied for. They also recorded family circumstances, if the person emigrated and to where or whether the borrower died. These records provide valuable insight into the effects of the famine on families. 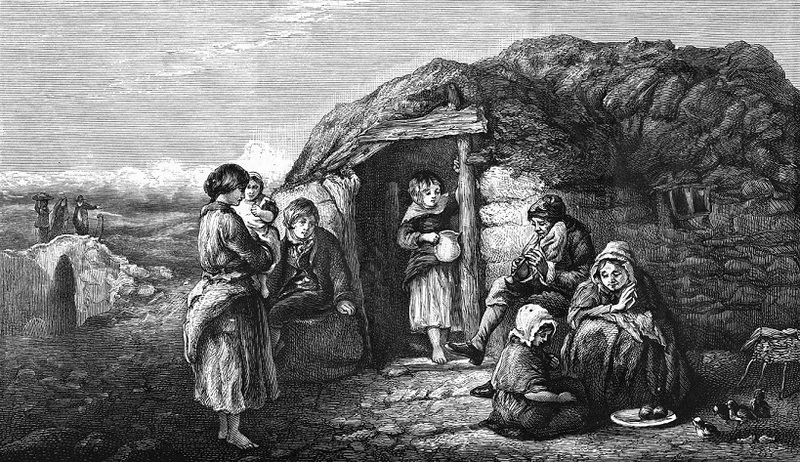 The Great Famine (an Gorta Mór), 1845 to 1852, was the darkest period in modern Irish history. It was a period of mass starvation, disease and emigration, which devastated the lives of over a million men and women. Within the records we can find in the evidence of the effects of the famine on the population. In 1846, the County Kerry board recorded in their minutes that they have ‘taken into serious consideration the destitution, with which this Country is threatened and the scarcity of food and consequent high prices’ and in County Limerick the board recognized in 1850, ‘the wide wasting calamities with which Ireland has been afflicted for the last four years.’ The Returns to the Clerk of the Peace further record hundreds of names of those who have died, emigrated to America or England or are still alive but living in very poor or devastating circumstances. To assist with further study of the records, Findmypast has created an additional record set, Ireland, Poverty Relief Loans 1821-1874 Browse, which allows you to browse through chosen volumes of papers. These ten counties listed were the location for the ten county boards. Depending on the specific record type and source the place name or residence may refer to the townland, parish or even an estate. Within the loan application or ledgers usually a parish or town was sufficient for the borrower’s residence. It was not always necessary to include a house number.